Here's a little Elle Sees fact: I hate sports. I never played them. I don't watch them. But, for a few months every year, I succumb to COLLEGE FOOTBALL mania, specifically University of Georgia, home of the Bulldogs. Nearly every Saturday during those months will be spent watching football, discussing football, wearing one of various UGA shirts (or all dressed up in your finest red and black dress if you're actually at Sanford Stadium), and cheering on the Dawgs. And then I turn back into my regular self once college football season is over. Choose polish in school colors. Paint base coat. I chose black, but did a red nail just to show the result. If your colors are too bold for you, use a white base. 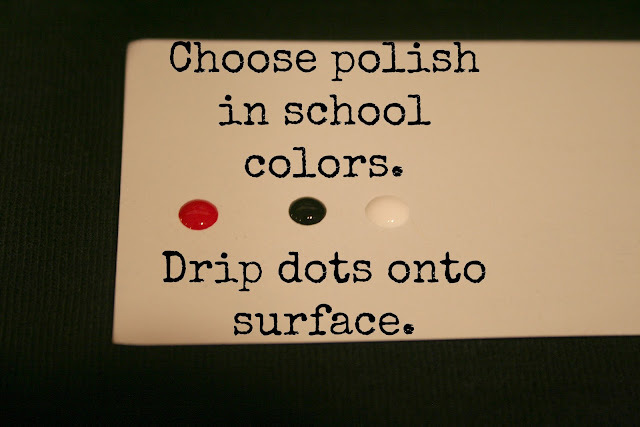 Get your paper ready and drip a couple of dots of polish onto it. I don't have a fancy nail art tool, so I used a flat pin to make my dots. To make it easier to hold, stick the pin into the end of an eraser on a pencil. Dip the pin into the paint and dot the nail. 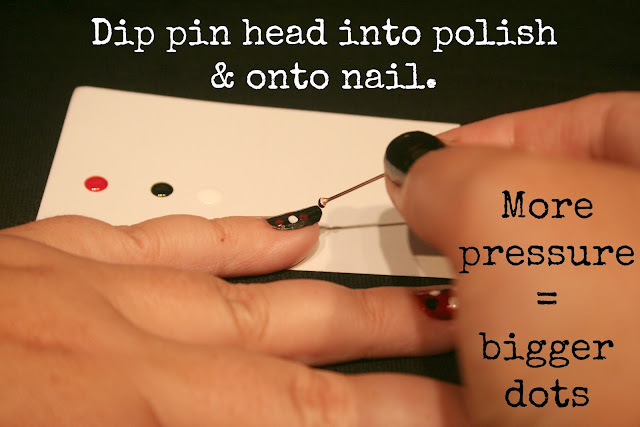 Wipe off the pin head before moving onto another color. The more pressure you apply, the bigger the dot. Let dry and seal with clear polish. That's it! 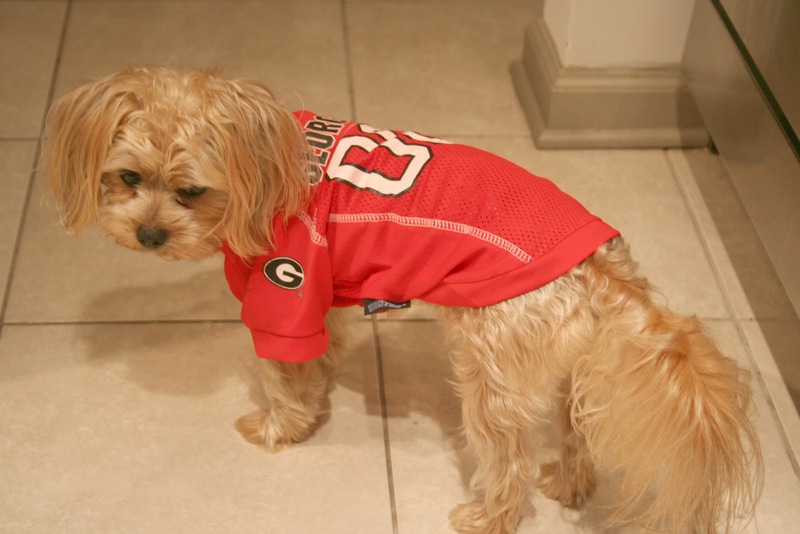 For extra spirit, put your pup in a team jersey! Charlie the Morkie lovessss his. Can't you tell? Ok, maybe he's over football season already? Or not amused with my Spirit Fingers? Charlie Brown says, "Gooooo DAWGS! Sic 'em. Woof, woof, woof." You know it's serious when your doggy gets involved! These nails are really cool. A great way to inspire team spirit! Aww Charlie Brown is too too cute! I am also a Georgia fan! Go Dawgs! I love this idea and will definitely be doing it at least once this season. Thanks for the tip! he's a very cute boy for sure! Do you go to Georgia? I graduated form there! GOOOO DAWGS! Sic em! 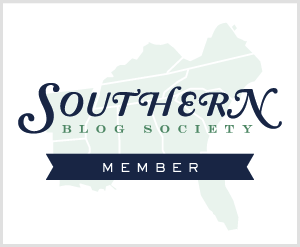 Are you living in Georgia? How did I miss this? I live about 40 mins from Athens :) Btw, cute nail DIY! How clever. There are certain color-combinations that instantly remind me of specific sports teams. Like blue/white (Dodgers), blue/yellow (Mets), black/white (Yankees). You've given us a cool way to play with that. Your pup looks so cute! During games, our beagle wears a Jets scarf to support my husband's favorite football team. I go to one game each year, maybe I'll surprise everyone with team spirit nails. 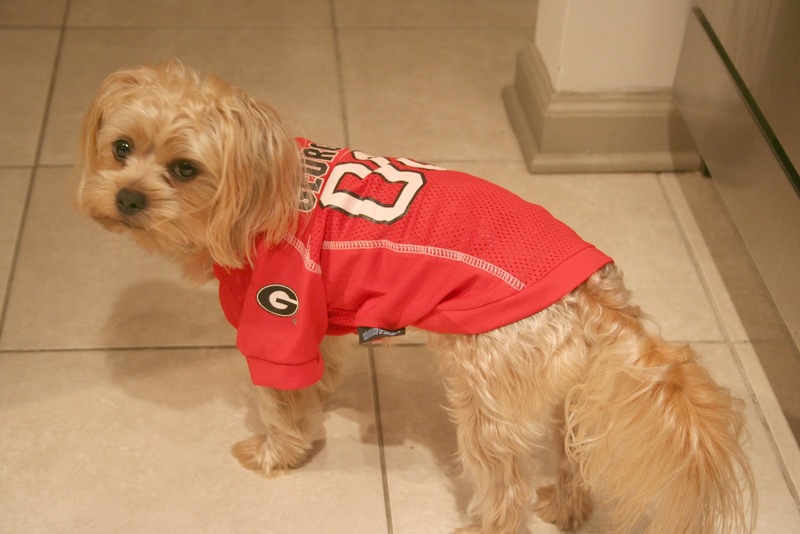 I had NO idea you were an UGA fan! :) In my house we are huge football fans, and UGA is our college team (my husband lived in Georgia for many years). 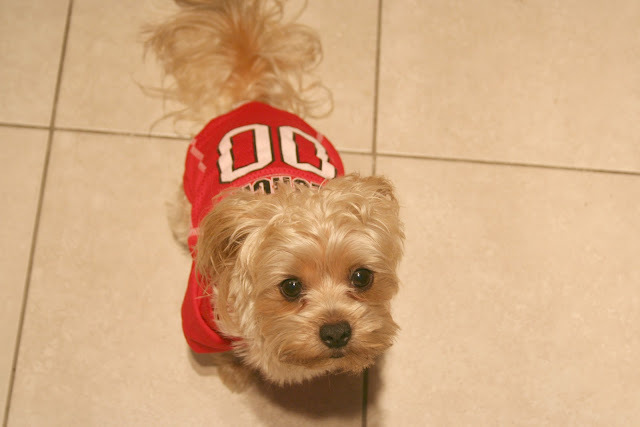 Love this idea and your doggie's cute jersey! Very cute, and not just for sports stuff! August loves his jersey, too :) Love the dotting tool idea! I was in a hurry doing my game day mani last Saturday so it was pretty uncreative. I'll have to try that next time. cute idea. I'm not really into sports either unless you are talking about baseball. Then I'm all over it. ok the nails are cute, but the dog shirt...CUTEST!! 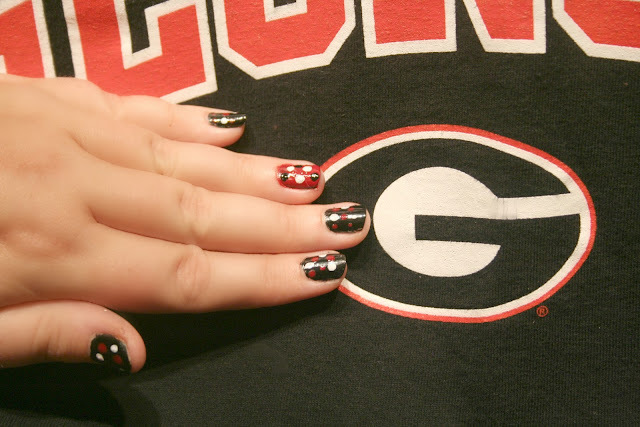 Your nails look great, even though I'm not a Georgia fan. Go Clemson!! Fun! I'm a total sports girl, but my sister isn't. Go figure! And I love how easy polka dot nails are. And so fun to play with color combos. Aww Charlie is too cute! 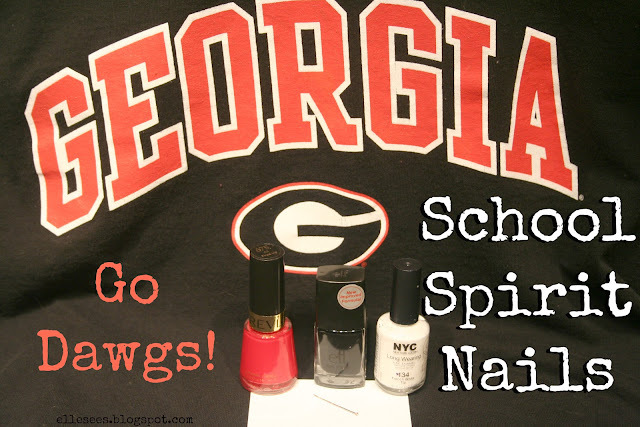 I should paint my nails red for my alma mater! So cute! Totally doing this! p.s. I can't believe you haven't attended an event before! 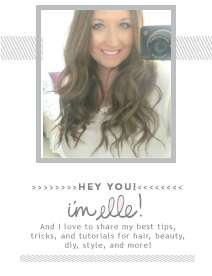 I'd love to chat with you if we were ever at the same event. Cute nails! I wish I could get a jersey for my puppy, but the darn thing is still growing! This is too cute. Can't really have coloured nails for work but that hasn't stopped me from buying a few polish yesterday.